The No. 4/6 University of Florida softball team completed its fifth three-game Southeastern Conference sweep of the season, defeating No. 3/5 Tennessee, 7-2, in the series finale Sunday afternoon in front of a crowd of 1,639 to earn the program’s fourth consecutive SEC Eastern Division title, fifth overall. The Gators will head into the SEC Tournament Thursday having won 17 of their last 18 contests. 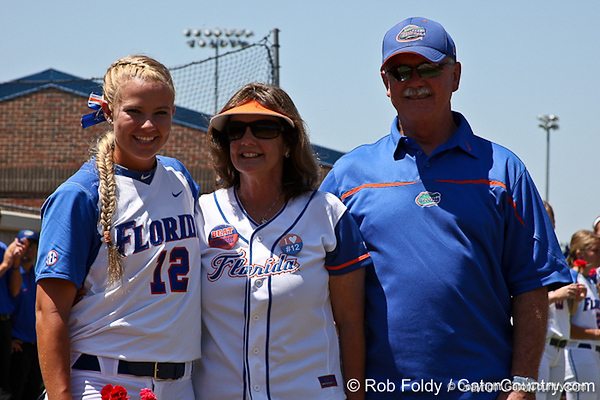 In the second day of senior weekend ceremonies, the Florida program and Gator faithful celebrated the contributions of seniors Kelsey Bruder, Megan Bush and Aja Paculba in a pre-game ceremony after honoring pitcher Stephanie Brombacher and catcher Tiffany DeFelice on Saturday. This year’s senior class concluded its last regular-season series with an overall record of 229-28 (.891) and a 94-13 (.878) SEC mark. Paculba shined on her senior day, going 2-for-3 with two runs, one RBI and a walk, while sophomore Brittany Schutte and junior Michelle Moultrie each went 2-for-4 to down the Vols.